Mount Airy is located at 36°30′N 80°37′W﻿ / ﻿36.500°N 80.617°W﻿ / 36.500; -80.617 (36.5006, −80.6093), along the Ararat River, about 5 km (3 mi) south of the Virginia state line. The United States Census Bureau says the city has a total area of 8.4 square miles (22 km2), all of it land. The city is located at the foothills of the Blue Ridge Mountains, about 14 miles from the Blue Ridge Parkway. 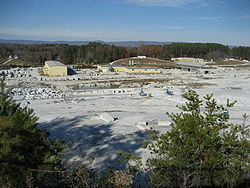 World's largest open faced granite quarry, near Mount Airy. In the city, the population was spread out with 21.6% under the age of 18, 6.5% from 18 to 24, 25.1% from 25 to 44, 21.3% from 45 to 64, and 25.6% who were 65 years of age or older. The median age was 43 years. For every 100 females, there were 84.5 males. For every 100 females age 18 and over, there were 78.4 males. The median income for a household in the city was $26,910, and the median income for a family was $33,412. Males had a median income of $27,299 versus $24,830 for females. The per capita income for the city was $17,237. About 17.4% of families and 19.9% of the population were below the poverty line, including 24.7% of those under age 18 and 20.7% of those age 65 or over. Actor Andy Griffith was born in Mount Airy, and the town is believed to have been the basis for Mayberry, the setting of the TV shows The Andy Griffith Show and Mayberry RFD. The community holds an annual "Mayberry Days" celebration during the last weekend of September; 30,000 attended in 2009, and 50,000 attended for the show's 50th anniversary in 2010. 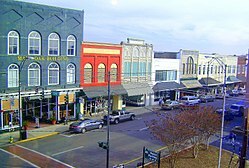 The University of North Carolina at Greensboro estimates the town receives $5 million each year as a result. Surviving members of the cast, along with family members of other cast members, often visit. The 2012 event was slated to have Karen Knotts (Don's daughter) and George Lindsey Jr. (eponymous son of the actor who portrayed Goober). Three Ford Galaxie police cars, painted to resemble those used on the show, give rides to tourists. A barber shop has been named "Floyd's", and a salvage yard has the name Mayberry. The Andy Griffith Museum, founded in 2009 by Emmett Forrest, attracts 200 visitors a day. The 2,500-square-feet museum, located half a mile from Griffith's childhood home, houses the world's largest collection of Andy Griffith memorabilia. Held the second weekend in October, the Autumn Leaves Festival attracts over 200,000 people to the city during the festival weekend. The festival is home to artisans and local vendors selling their unique goods. Around 200 vendors attend the Autumn Leaves Festival, including many food vendors that serve regional favorites such as ground steak sandwiches and collard green sandwiches. With a rich heritage in bluegrass and old-time music, a main stage is set up for local artists to carry on traditional and contemporary bluegrass, gospel, and old-time music. The home of old-time music legend Tommy Jarrell, bluegrass gospel legends The Easter Brothers, country singer Donna Fargo, Mount Airy has a long history with regional music. Mount Airy's WPAQ 740 AM radio is one of the few Bluegrass and Old-Time music stations still operating and has been airing the live radio show Merry-Go-Round from the Downtown Cinema Theatre since 1948. Weekly bluegrass jam sessions at The Andy Griffith Playhouse and the annual Mount Airy Fiddlers Convention also serve to attract old-time musicians from across the region and the world. The Fiddlers Convention first began in 1972, and is held the first weekend in June at Veterans Memorial Park. The Blue Ridge Music Center with its amphitheater and music museum of old-time music is just a few miles away on the Blue Ridge Parkway at Milepost 213, near Galax, Virginia. This area is home to the Round Peak style of old-time music, which started in the Round Peak community, just north of Mount Airy. Mount Airy was the residence of Chang and Eng Bunker (1811–1874), conjoined twins joined by a band of cartilage at the chest (xiphopagus). They are buried at White Plains Baptist Church about 2 miles from Mt Airy Main street. The Mt. Airy Public Library serves the community. The library won the American Institute of Architects Design Award. Mount Airy has a city-funded school district consisting of four schools. Mount Airy High School was selected as a North Carolina Blue Ribbon School in 2011. There are also other schools in Mount Airy that are controlled by Surry County. Therese Browne Abraham (1936-), mayor of Canadian, Texas, from 1982 to 1992, is a Mount Airy native who resides in both Canadian and Sarasota, Florida. Chang and Eng Bunker (1811–1874), the famous "Siamese Twins" conjoined twins of showman P.T. Barnum settled in Mount Airy after they retired from show business. Donna Fargo (1945- ), country music singer and songwriter, best known for the song "The Happiest Girl In the Whole USA"
Luke Lambert, NASCAR Crew Chief. ^ a b "2010 City Population and Housing Occupancy Status". U.S. Census Bureau. Archived from the original on July 21, 2011. Retrieved May 12, 2011. ^ Dickson, Scott (2005). In Search of Mayberry. Boone, North Carolina: Parkway Publishers, Inc. p. 75. ISBN 1-887905-98-7. ^ a b "History of Mount Airy | Mount Airy, NC - Official Website". www.mountairy.org. Retrieved 2018-02-05. ^ "Blue Ridge Parkway « Visit Mayberry". www.visitmayberry.com. Retrieved 2018-02-05. ^ "NowData - NOAA Online Weather Data". National Oceanic and Atmospheric Administration. Retrieved 2013-07-03. ^ "The Andy Griffith Show built North Carolina on the backlot". avclub.com. Retrieved July 10, 2014. ^ a b "Famous Citizens/History". mountairydowntown.org. Archived from the original on April 30, 2013. Retrieved August 6, 2012. ^ "Squad Car Tours". VisitNC.com. Archived from the original on 2018-02-14. Retrieved 2018-02-13. ^ Washburn, Mark (2010-08-28). "Goober's suit enshrined in town Mayberry built". The Charlotte Observer. Archived from the original on 2013-01-05. Retrieved 2010-08-28. ^ a b Stange, Keith (2013-01-12). "Emmett Forrest, long-time Andy Griffith friend, has died". The Mount Airy News. Archived from the original on 2013-01-31. Retrieved 2013-02-10. ^ "Well, I'll be: Andy Griffith Museum opens". The Business Journal. 2010-01-13. Retrieved 2013-02-10. ^ a b c "Mayberry North Carolina | Bluegrass Music Festivals | NC Events". Autumn Leaves Festival. Retrieved 2018-02-05. ^ www.paleosun.com, PaleoSun, Inc. Web Development,. "Mount Airy Bluegrass and Old-Time Fiddlers' Convention | Blue Ridge Music Trails". Blue Ridge Music Trails. Retrieved 2018-02-13. ^ "Mt. Airy Public Library." Mazria Inc. Retrieved on August 28, 2012. ^ "North Carolina Blue Ribbon Public Schools | PublicSchoolReview.com". www.publicschoolreview.com. Retrieved 2018-02-05. ^ Jay Brady (November 21, 2011). "Doctor created medication and founded art museum". Sarasota Herald-Tribune. Retrieved September 22, 2014. ^ "Luke Lambert makes dream come true with NASCAR", Mount Airy News, 22 October 2012, Accessed: 25 January 2016. 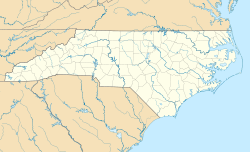 Wikimedia Commons has media related to Mount Airy, North Carolina.